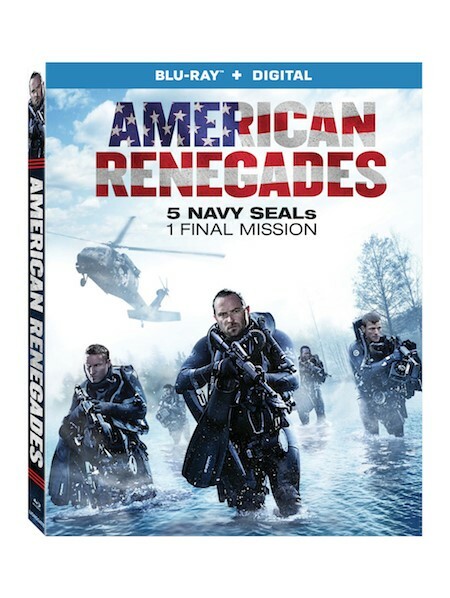 Join five brave Navy SEALs on their mission abroad when American Renegades arrives on Blu-ray™ (plus Digital) and DVD January 22 from Lionsgate. Academy Award® winner J.K. Simmons (Best Supporting Actor, Whiplash, 2014) leads the way in this edge-of-your seat heist film, jam-packed with explosive action at every turn. From the director of Into the Storm and Final Destination 5, and also starring Sullivan Stapleton, Ewen Bremner, Charlie Bewley, and Sylvia Hoeks, the American Renegades Blu-ray and DVD includes four never-before-seen featurettes and will be available for the suggested retail price of $21.99 and $19.98, respectively. While on assignment in war-torn Bosnia, a team of Navy SEALs discovers the existence of a treasure hidden by the Nazis at the bottom of a lake. In an effort to help the locals, the SEALs engineer a covert operation to retrieve the gold and return it to its rightful owners. After a deadly turn of events, the team is detected by the enemy — and left with only ten hours to carry out the mission. Title Copyright: Program Content © 2016, Package Artwork © 2018 EuropaCorp – Studio Babelsberg. All Rights Reserved. Package Design and Summary © 2019 Lions Gate Entertainment Inc. All Rights Reserved. Rating: PG-13 for violence, brief sexuality and language.